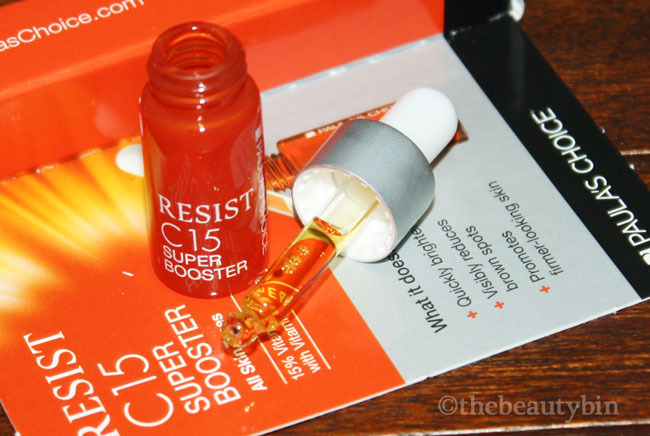 I have been using the RESIST C15 Super Booster for almost a month now (thank you for the trial size, Paula's Choice Philippnes!) and this tiny dropper bottle has never let me down! It instantly brightens my skin after use which makes up a lot for the other discouraging skin imperfections I wince from-- pock marks and huge pores. A moisturizer or a serum? The website does not particularly mention it's a serum (like it does with its other products) but I'd say it is one. It is described as a concentrated, light-as-water liquid treatment product designed to supercharge serums or may be used alone. It is a blend of 15% stabilized vitamin C (l-ascorbic acid) at a pH of 3.0, vitamin E, ferulic acid, and peptides which altogether repairs visible signs of aging and stimulates collagen production for smoother, brighter, and firmer skin. The 3.5ml trial bottle can last 3-4 weeks despite it being designed for a two-week consumption. 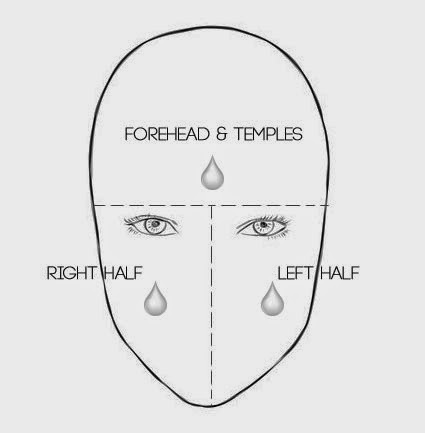 Directions for use is to apply once or twice daily after cleansing, toning, and exfoliating & dispense 2–3 drops and add to your favorite Paula's Choice serum, or use alone and follow with moisturizer where needed. First week: I used Paula's Choice RESIST C15 Super Booster 2x/day after cleansing & applying clindamycin, my antibacterial toner. I follow with Neutrogena ultra sheer or Banana Boat Sport sunblock in the AM and retinoic acid gel in the PM. Second week: I cut down use and applied at night only. I observed results were not very far from the twice-a-day habit. Third week: I've read that this product can oxidize over time rendering it less potent so I got back to using it twice-a-day. I thought I could skimp on this as once-a-day usage works mighty fine as using it 2x/day. Two things cringe-worthy about it is that it feels sticky upon application which consequently takes time to get absorbed, and it's not the best-smelling skincare product out there. However, it is able to improve skin clarity in an instant giving the skin a healthy, supple and bright aura. I have not noticed a significant improvement in skin texture in 3+ weeks of use. I like using the treatment in the morning as it helps face bases look a lot cleaner against the skin. Best news is that throughout the time I've used it (almost a month already! 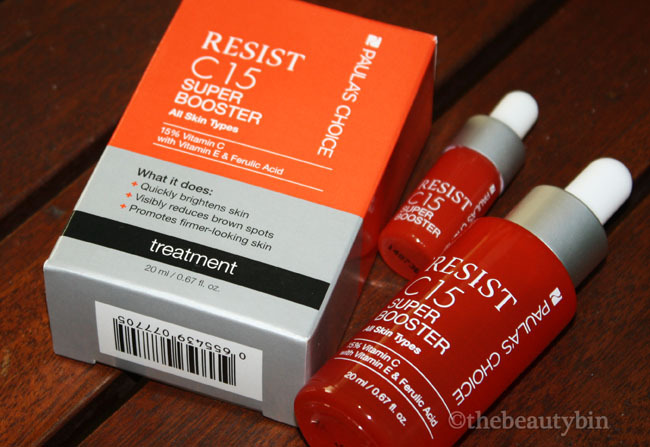 ), Paula's Choice RESIST C15 Super Booster proved to be hypoallergenic & non-comedogenic. It is economical to use, thanks to the dropper. Each bottle can last few more days/weeks than it actually should and that's always a good thing. The bottle and dropper-type cap are specially designed to prevent the product from unnecessary light & air exposure which can degrade Vitamin C and E.
Trial size bottle is great for travel! It's not a moisturizer, nor a pore shrinker, or a zit zapper. Also, the significant improvement in skin clarity dies down within the day. I would recommend constant use of the product may it be once or twice a day. Trial size is suuuper sulit at P500! I stumbled upon the Journal of Investigative Dermatology and learned how ferulic acid can provide additional stability to topical Vitamin C and acts as a photoprotector rendering Vitamin C effective even in the morning. What's even better is that with the right amount of ferulic acid in the solution, thymine dimer formation can be reduced thus lowering the risk for skin cancer! I've always known that with a brighter skin complexion, I can somehow get away with huge pores and acne marks. And true enough, I do. Oral glutathiones have addressed my dull & sallow skin but the weight gain is unforgivable. With Paula's Choice RESIST C15 Super Booster, I'm getting radiant skin everyday and people hardly notice I'm only getting around 4 hours of sleep on a daily basis. I will have to restructure my schedule to be able to get a healthier amount of rest and who knows, I might be able to make the temporary skin brightening effect permanent! The Inkey List Hepta-Peptide Blurs Your Wrinkles Away – But Can It Reduce Them, Too? Opps I Did it Again! WEDDING DECOR & ATTIRE SALE!